Madeleine Vionnet was born in 1875 in Aubervilliers, France. Apprenticed to a seamstress at an early age, she worked in the Paris suburbs in her late teens before joining Kate O’Reilly, a London dressmaker, in about 1897. She returned to Paris, working with David Bechoff, Callot Soeurs and Douçet, before opening her own house in 1912. Her work was interrupted by the World War of 1914-1918, but she re-opened in 1918, moving to 50 avenue Matignon. She retired in 1939. Vionnet is celebrated as master of the bias-cut dress, which moulds the body without restriction and flows with its movement. She was at the forefront of the neo-classical style, and her label depicts a classical image of a woman poised on a column raising the straps of her tunic above her head. From 1924 her embroidery designs were inspired by Greek vases and Egyptian frescoes. 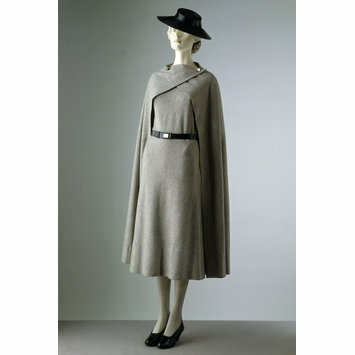 During the 1930s she largely abandoned her famous bias-cut dresses in favour of classical-style draping and folding. Many of her garments, including the dress in this ensemble, were ingeniously constructed in one piece, devoid of fastenings. 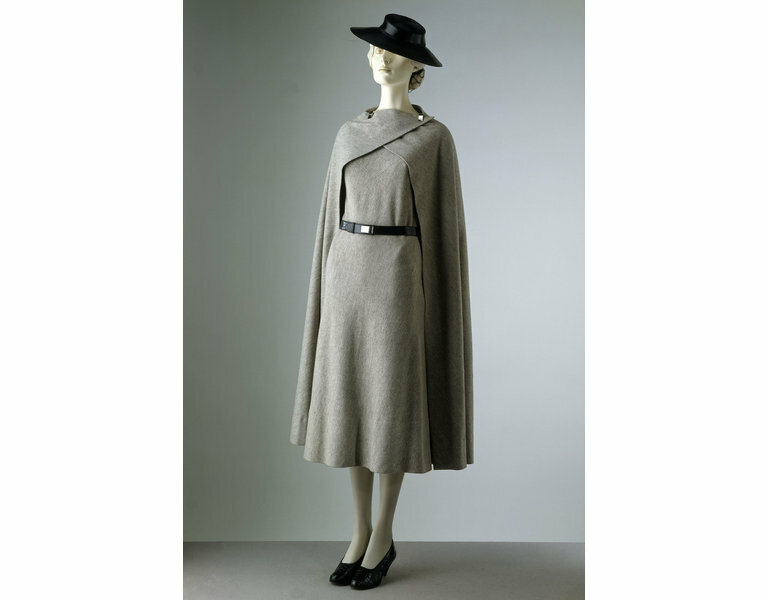 Vionnet was exceptional in that she did not sew down her draperies, but expected clients to perform a series of skilful manouevres to achieve the desired look. 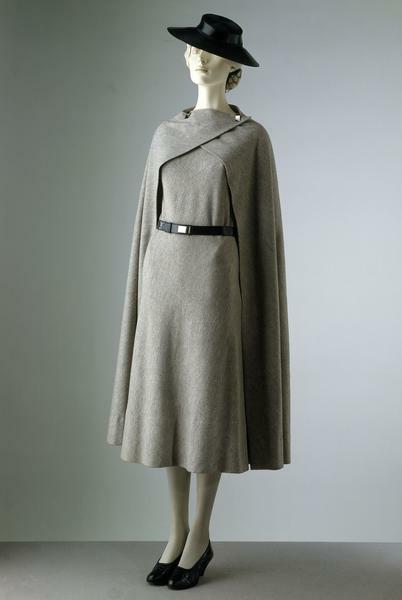 Day dress with cape of woollen jersey and two felt, chrome and leather belts. The outfit is an understated masterpiece with every tiny detail resolved by the designer. To achieve the correct hang and to avoid unnecessary bulk, the hems are turned once. The skirt was originally longer and the hem has been professionally altered, which slightly impairs its line.